Why won’t the ground shadows show on my stage floor? How do I get my model’s shadow to show? My model casts a shadow until I remove the grid. 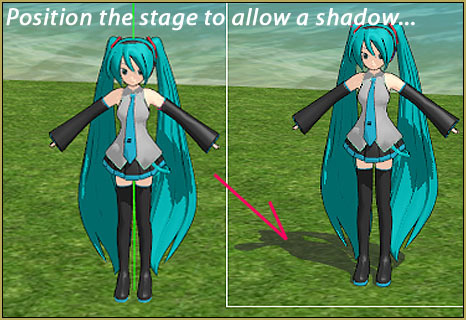 Adjust the stage to allow MMD to make ground shadows! 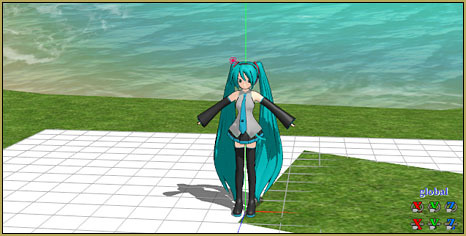 One of the powers of the 3D animation software, MikuMikuDance, is that it will generate ground shadows in your animation … but it will do so only at the precise level of the Coordinate Axis grid. If you have the grid positioned ABOVE your stage floor, the shadow (and the model) will seems to float above the floor. If you have the grid positioned BELOW your stage floor, the shadows will not be visible … and your model’s feet, standing on the grid, will look to be sunk into the floor. You might be tempted to use the Y axis control to raise (or lower) your model to make it “look right” as it stands on your stage. If you DO … the ground shadow will stay with the Grid … and probably will not show in your animation. 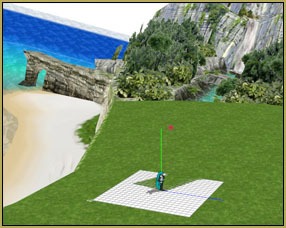 The “MMD Batokin Island” stage provides an extreme example of this shadow issue since the area I wanted to use was on a slant! 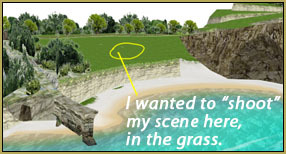 I had decided that I wanted to create my animation using that section of “grass” on the MMD Batokin Island stage. 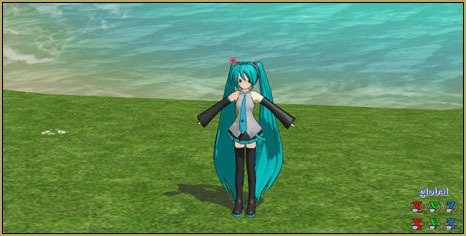 My first attempt found me moving Miku up and into the grass area of the stage. The problem was … how can I get Miku to cast a shadow? … will probably not require this much action … most stage models are designed to work well without needing this kind of adjustment. But … if you decide to “go off-road” … this technique may help you to cast shadows.